With the appealing architecture of its assembly hall and two spacious conference halls, the ERA Conference Centre will meet even the most demanding expectations. Except for the assembly hall, all the bigger rooms in the ECC provide flexible design options. 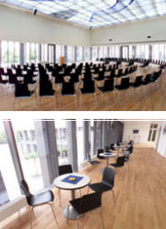 Through the effective use of partitions, the ECC offers a total of up to 12 conference rooms of different sizes.